Students gather to learn about traditional plants during the 4H culture camp in Clark’s Point, which was funded by BBNCEF. Photo courtesy of Avery Lill, KDLG. 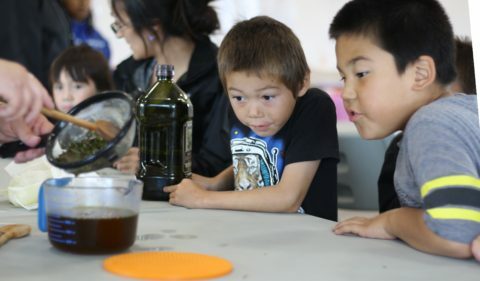 The goal of the Cultural Heritage Grant Program is to support organizations in the Bristol Bay region that engage BBNC shareholders, descendants and community members through a wide range of educational activities promoting, preserving and celebrating our Alaska Native cultural heritage and way of life. Preservation, practice and teaching Native languages of Bristol Bay. Native knowledge, history, skills and practices. Cultural activities, traditions, subsistence, traditional arts and crafts, dance, history. Eligible entities are welcome and encouraged to submit a proposal for consideration. The 2019 guidelines and application for each grant program can be found at the bottom of this page under Related Items. Rolling Application Submission: Cultural Heritage and the Native Place Name grant proposals are accepted on a rolling basis. Applications can be submitted throughout the year and award decisions will be made on a quarterly basis. In most cases, applicants will be notified of a funding decision within 6-8 weeks after the application is received at the BBNC Education Foundation. We hope that this change will allow additional flexibility for project planning and implementation throughout the year. We recommend applicants plan projects that would take place 3-6 months after the date the application will be received by the BBNC Education Foundation. In general, please allow 6-8 weeks for proposal review. Annual Eligibility: Organizations are eligible to apply for a maximum of ONE (1) award under each grant program (Cultural Heritage and Native Place Names) per calendar year. Current grantees with an open grant must submit a final report for their existing grant before a new proposal is submitted. At any time during the application process, you are welcome and encouraged to contact Ricardo Lopez, BBNC Education Foundation Program Officer, with questions or for additional assistance. He can be reached at: (907) 265-7852 or email: rlopez@bbnc.net. If you would like to receive a hard copy of the application materials, please email us at bbncef@bbnc.net.